Naukasana means an asana in boat shape. Our body is made to stretch in the shape of a boat. ‘Nauka’ means ‘boat’ and ‘asana’ means ‘pose’. It tones the abdominal muscles and stretches the whole body. It can be done in both the sides. Upside and backside(lying on stomach). In this pose blood flow faster to abdomen and lower back of the body. For beginners try to bent as much as possible, don’t strain and hurt your muscles in the beginning. Gradually you can improve. 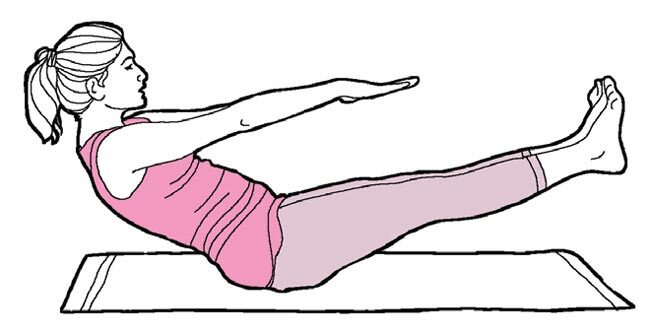 Lie down on the yoga mat with hands on the side of your body. Take a deep breathe and lift your legs and upper part of your body above the ground. Lift the arms and keep it parallel to the ground. Eyes, arms and toes should be in same line. Feel the pressure near the navel area as the muscles around the abdomen contract. Do normal breathing holding the boat position for atleast a minute. While exhaling slowly get back to the normal position. Relax and breathe normally. Repeat the asana as many times as possible. This asana helps in reducing the belly fat. Tones the muscles of legs and arms. Helps in regulating the functions of liver, pancreas and kidney. Helps in developing six ABS on regular performing of this asana. Keeps the body active throughout the day. 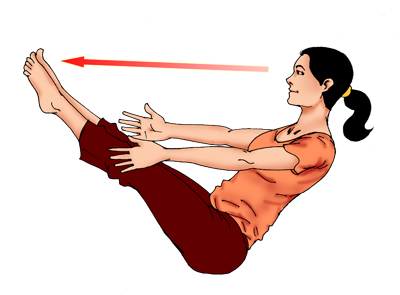 Pregnant women should avoid doing this asana. Women should avoid doing this asana during menstruation period.